This article was updated on 10 December 2018. While Christmas may be considered an over-commercialised affair, the Swiss hold true to their roots. Traditional Swiss Christmas typically lasts from the beginning of Advent (Sunday 2 December November 2018) to the end of Epiphany (6 January 2019). While each Swiss home may give the tradition a slight twist, some customs have remained intact: the excitement, for example, when children open the first window of their Advent calendars to discover a tasty treat; lighting one candle on the Advent wreath each week until the great day eventually arrives; or uncovering the candle-lit Christmas tree on Christmas Eve, a German tradition that dates back to the 1500s. Advent will soon be in full swing and Christmas is right around the corner, so whether it’s holiday shopping, cookie baking or wreath making, now is the time to slip into a festive mood and greet the holiday season the good old-fashioned Swiss way. If you’ve lived in Switzerland long enough, you know first-hand that the Swiss bring their own rituals to the dinner table. There is no particularly “traditional” Christmas dinner because it varies from region to region. In Geneva, for instance, it’s not uncommon to feast on chestnut-stuffed turkey with gratin de cardons made with thistle artichokes. In Vaud, the emphasis is often on splashing out and reducing the amount of time anyone has to spend in the kitchen – foie gras, oysters, smoked salmon, fondue Chinoise … Those with a sweet tooth are in luck, as the Swiss are known for the most delicious Christmas biscuits: think pain d’épices – aka gingerbread – cookies spiced with cinnamon, anise and hazelnuts, brunsli (the Swiss take on brownies, but not as gooey as the American ones), and jam-filled biscuits in all manner of shapes. And not a Christmas pudding or mince pie in sight – a boon for those who detest dried fruit. Feel like sneaking out of your cinnamon-infused home to take a break from baking? Head to one of the many outdoor Christmas markets scattered throughout across Switzerland – it seems as if every self-respecting town and village has one, usually involving vin chaud and delicious food either to eat on the spot or to buy as gifts. Geneva has a Christmas market offering arts and crafts, handmade winter garments and specialty foods with an “international” twist on rue du Mont-Blanc – see below. You’re bound to find knick-knacks from different parts of the globe. Go with a budget and expect to stay within it: inexpensive but beautiful crafts make great gifts to place under the tree. Open from 23 November to 26 December until 19:30 (except Sunday: 20:30) – and it’s closed on Monday except for the 17th and 24th. There are also many neighbourhood markets around the city – keep your eyes open for posters and/or look them up on the internet..
One of the best-known Christmas markets is in Montreux, with its magnificent views of the snow-capped Alps and its exceptional décor – especially at night, when glowing snowflakes hang from the leafless tree branches. More than half a million visitors flock there each year, for its wide variety of Christmas souvenirs and delicacies, from artisan crafts to Christmas sweets to heaping cups of hot speculoos drinks and vin chaud. Just what you need for a Christmas spirit boost! Bring your children and head to the Rochers-de-Naye to Santa’s house (see website for ticket prices). Look out for Santa’s sleigh in the skies between 17:00 and 19:00 along the lakeshore. Open daily from 22 November to 24 December 2018, with special events on the weekends such as the Medieval Market at the Château de Chillon, open from 10:00 – 17:00. See below. 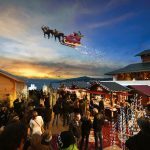 Lausanne’s Christmas market is in several locations – Place St François with its 50 wooden chalets, Place Pépinet featuring crafts by artisans and the Flon with its ice rink among other attractions. You can also enjoy the light sculptures dotted about the city as you make your way from one place to another. See below. It is also worth mentioning the market in the Morges (5th to 9th December and from 12th to 16th December 2018) in the Morges castle. In neighbouring France, there are several markets, for example the one in Annecy from 23 November 2018 until 6 January 2019 with its sound and light show on the façade of the town hall from 17:00 till midnight. In Annemasse old town, Bonjour l’hiver is a street arts festival and Christmas market and village. And in Evian from 14 December 2018 until 6 January 2019, the “Flottins”, fabulous giant driftwood figures, take to the streets from 15:00 till 19:00, with storytellers, comedians and circus performers. And when you’ve shopped till you’ve dropped, take time to reflect and unwind at one of the carol concerts offered at local churches throughout the season (see individual websites for details). From 23 November to 26 December 2018. The perfect place for wandering and also sampling and filling your shopping basket with purchases, the Rue du Mont-Blanc Christmas Market starts in November running through most of December. For around a month, you can discover local culinary specialties and handmade gifts in a warm and inviting atmosphere. To view a map and opening times click here. From 6 to 31 December 2018. This market at Parc aux Bastions in Geneva combines Christmas with street food and a fondue chalet with a fine selection of cheeses. From 12 December until 16 December 2018. This is the largest covered Christmas market in French-speaking Switzerland. Exhibitors present their wares in the town’s chateau. Good quality food, wine and craft beer are served in a relaxed rustic atmosphere. From 22 November until 31 December 2018. Between magic and conviviality, the markets of Saint-François, Pépinet and Flon are look forward to welcoming and immersing you in the magical atmosphere of Christmas. Like every year, Lausanne’s craftsmen also welcome you on three evening openings, so you can do your Christmas shopping. For a full list of Lausanne’s markets with opening times click here. From 22 November until 24 December 2018. On the shores of Lake Geneva, Montreux’s Christmas market has one of Switzerland’s most picturesque settings. 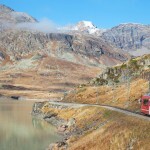 It also offers nearby Christmas attractions such as a cog train visit to Santa 2,000 metres up, in his house at Rochers-de-Naye, the atmospheric Christmas Village in Caux, or the Medieval Enchantement within the walls of the legendary Château de Chillon. For 22 years, the Montreux Christmas Market has delighted around 500,000 visitors annually, from around Switzerland and the world. From 22 November until the 24th of December 2018, the Montreux Christmas Market features 150 decorated and illuminated chalets along the lake edge. From 1 December until 24 December 2018. In December, the cobblestones, the temple and the castle around Pestalozzi Square in Yverdon-les-Bains will be aglitter with the lights of the city’s dazzling Christmas market filled with winter delights. Charming chalets and stalls set up around the by now traditional Christmas tree and also in the cellars of the medieval castle propose ceramics, handcrafted jewellery, mulled wine, regional beer and other terroir products. To view a map and opening times click here. For the 25th time over 100 stands will fill Zurich’s main station. The display includes a towering Christmas tree with crystal decorations. The Zurich Christkindlimarkt has been held in the historic main hall of Zurich’s main station since 1994. The main hall was built in 1871 based on plans by the architect Jakob Friedrich Wanner. What started with roughly a dozen market stells has now become one of the largest indoor Christmas markets in Europe. A Christmas tree decorated with thousands of crystal ornaments was first added in 1998. 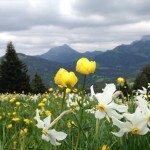 The Emmentaler Stöckli has been a guest here since 2004. From 30 November until 19 December 2018. From 30 November 2018 there is a Christmas market at Franziskanerplatz in Luzern. From 22 November to 23 December 2018. Basel claims to have Switzerland’s largest Christmas market and the city on the Rhine has a very special charm over the Christmas period. 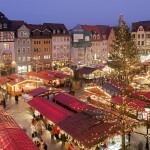 The quaint Christmas market can be found on Barfüsserplatz and Münsterplatz, right in the centre of the city, at the heart of the festively decorated Old Town. A magnificent Christmas tree stands on the Münsterplatz, with ornaments by the well-known decorator Johann Wanner. Over 180 traders and artisans offer their goods for sale in small, rustic wooden chalets. Culinary delights abound with waffles, glühwein, genuine Basel Läckerli (a kind of gingerbread), delicious Swiss raclette or ever popular grilled sausages. Like last year, visitors can also enjoy Christmas delicacies and a festive atmosphere at Claraplatz (in Kleinbasel, on the right banks of the Rhine. Official opening of Christmas in Basel takes place at 6.30 pm on 22 November 2018, when the city’s Governing President, Dr Guy Morin, switches on the Christmas lights at Münsterplatz. Open daily from 11 am to 8.30 pm – exceptions: 23 December 2018, Münsterplatz: 11 a.m. to 6 p.m. 23 December 2018, Barfüsserplatz: 11 a.m. to 8 p.m.
From 1 December to 24 December 2018. Opening hours: Daily 10:00 – 20:00 – exceptions to closing time: Sunday 18:00.